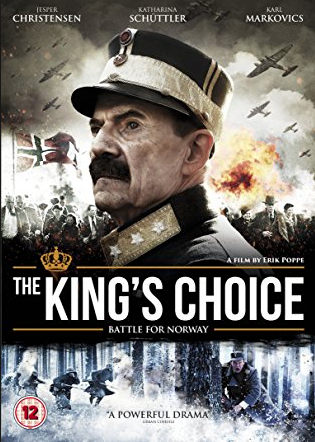 The King’s Choice is a Norwegian movie about King Haakon VII’s difficult decision after the German invasion of Norway. Last year, I watched and reviewed April, 9 which tells of the speedy invasion of Denmark. It’s an amazing movie because it tells a story that is lesser known. The King’s Choice does the same for Norway and also begins on April, 9. If you’re familiar with the role of the Nordic countries during WWII, you’ll know that Norway didn’t surrender within a few hours like Denmark, but that they put up a fight which lasted several months. I’m a bit ashamed to admit how little I knew of the history of these two countries. I had no idea that the king of Denmark was the king of Norway’s brother. Haakon VII was the first, democratic elected king of Norway. He became king in 1905, after the union with Sweden ended. The movie tells us about that at the beginning and shows a lot of amazing original footage. Like in the UK, the king wasn’t ruling, but the parliament was and, so, when the Germans invaded and occupied the Norwegian ports, it was up to the government to decide what to do. Hitler needed Norway just as much as he needed Denmark, because of the long coast line, but also, in Norway’s case, because the country was rich in sources of iron ore. Pretending that Norway was threatened by England, who allegedly was going to invade Norway, Hitler offered his protection under one condition — immediate surrender. The movie explores how difficult it was for the government to make a decision. Many thought that surrendering would be the safest choice. In the end, lacking determination, they relied on the king to make a choice. By the time the king met the German ambassador, Norway had already been under fire. The king and his family were in grave danger. The king eventually made a decision, but he didnn’t want to reveal it because he felt, that the decision should be made democratically. In the end, he just informed them of what he would do, in case of immediate surrender – abdicate. The choice King Haakon made is admirable for many reasons, but also because he wasn’t well. He was very frail, suffering from terrible back aches. The war put an immense strain on him personally but he never thought of himself when making his decision. A movie like this could have gone many ways. It could have been dry and boring or too educational. It was nothing of the sort. It was a pure joy to watch. I was so impressed with Jesper Christensen who played Haakon VII. He’s spectacular. Haakon was an old man, suffering from terrible back aches. Watching Christensen play this role, it’s hard to believe he’s younger and healthy. I wasn’t surprised to find out that he’s a stage actor. You can always tell when a movie actor is also a theater actor. The role of the German ambassador was played by the German actor Karl Marcovics, another seasoned actor. The acting alone makes this movie well-worth seeing, but then there was the mood and the atmosphere which was absolutely wonderful. It’s very mournful and melancholic as befits the topic. (The superlatives are chasing each other in this review). Cinematography, music, and acting went hand in hand to create a beautiful and very moving film. I would go as far and say it’s a work of art. No wonder it was nominated for an Academy Award. This is certainly the perfect companion piece to April, 9. Do yourself a favour and watch it. This entry was posted in History, Movie, Reviews, Trailer, War Movie, WWII and tagged History, Jesper Christensen, Karl Markovics, Norwegian Movie, Review, The King's Choice, War Movie, WWII.